The Asteria Collection, Handcrafted Exclusively for Bloomingdale’s. of the Titanes, Asteria was pursued by the god Zeus. She fled his advances, transforming herself into a quail and leaping into the sea where she became the island of Delos. The Quantis Coil unit features strategically positioned comfort zones that provide superior support to the hips, back and shoulders. The distinct difference in the firmness, density and spring act together for exceptional comfort. The high coil count offers an even surface, keeping sleepers from rolling together at night. Generous natural exotic fillings are the essence of Asteria, with layers of cotton, New Zealand wool, Alpaca and Cashmere creating remarkable feels. Resilient natural latex create a plush feel, conforming instantly to embrace your body’s unique shape. It distributes weight evenly, reducing the pressure points that cause tossing and turning. When copper is added to sleep products, it provides consumers with unique health benefits including relief from arthritis, bursitis and rheumatism in addition to blood circulation and metabolic benefits. The Asteria Collection also features several luxury appointments. The collection is fully outer compression tufted by hand, securing the upholstery layers to ensure that they will not settle or shift over time. An impressive 18 slat spruce wood construction, additional center rail and increased edge support all add up to superior stabilizing support, durability and extended life. 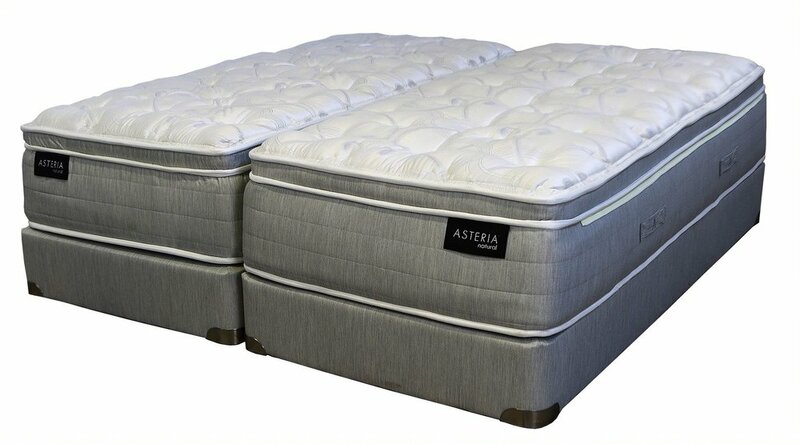 Because sleeping partners may not always agree on how to define comfort, the Asteria zip and link service allows the joining together of two mattresses with different comfort levels to suit the preferences of each sleeping partner. The exclusive zip and link design completely eliminates motion disturbance that can wake you up at night by allowing each person’s side” to act independently of their partners. The Asteria Collection is adjustable base friendly, allowing your body to experience customized posture, pressure relief, and support.